Migratory art refers to works that are visual (or aural) representations of the act of migration, made by immigrants. The concepts of body horror, evolution, and audio stimuli illuminate their aesthetic qualities and shared ambition: to be active empathy agents. He insists that between him and the statuette there is something more than aesthetic experience; by . . . looking at the statuette . . . there might come a moment when boundaries can be abolished; it might be possible to establish contact with . . . a world where people adored those statuettes, offered sacrifices to them. Cortázar’s story is animated by the act of movement: the two principal characters arrive in Greece from different countries, and the intersection of their journeys results in an encounter with a statuette that, displaced from the time when it held the status of an idol with metaphysical value, becomes an artifact with monetary value. Their attitudes toward the statuette diverge after they discover it: they set out looking for some artifact; when they discover a specific figure, embodied, and with a history, while the Frenchman retains his rational attitude, Somoza believes that his aesthetic experience has become an act of contact: with that moment in time in which the statuette was an active cultural agent, with the people who gave it its agency with their acts of faith. This act of human movement creating, first, an encounter between spectator and art and, then, through and with the art a moment of contact with the people behind it, encapsulates the aesthetic ambition of migratory art: they are artistic expressions of movement and displacement; viewers, through their aesthetic experience of the artwork, initiate contact with and consequently gain empathy for the displaced whose narratives they witness. 4. Finally, they make viewers witness acts of displacement to evoke empathy for the displaced: this is their primary aesthetic purpose. Let us examine three artworks to see—witness—these ideologies in action. 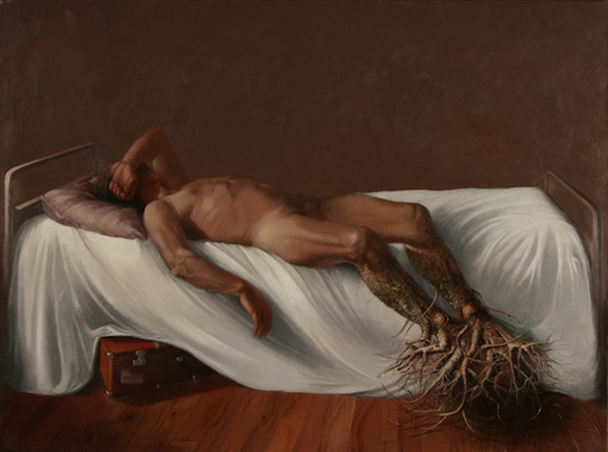 Naman Hadi, an exile from Iraq who now lives and practices his art in Paris, turns his own body into a spectacle in Le Déraciné (“Uprooted”) by depicting it in a stance of uneasy repose: the crook of his hand drapes his face that is turned away, while his legs morph into the roots of a tree that, uprooted—violently, it appears—from the earth of his homeland, give the painting its title (fig. 1). In becoming inscribed with act of displacement, the depicted body undergoes an erasure and becomes an uncanny landscape. The word unheimlich, credited to Freud, commonly translated as “uncanny,” at its German root means a “feeling of not being at home.” Seen in this light, the reclusive figure in Hadi’s painting is a body that can no longer be at home in its homeland and that cannot feel at home in its host land. The reclusive figure in Hadi’s painting is a body that can no longer be at home in its homeland and that cannot feel at home in its host land. This sort of physiological deviation that Hadi paints is a familiar sighting in horror films: the shape-shifter who performs an act of abjection by moving between one kind of identity and another. The biologist R. A. L. Cruz points out that at a certain point during evolution, most organisms “will commit to a . . . particular set of tissues and organs,” and “even in animals that undergo metamorphosis, structures in the larval form rearrange to form the equivalent parts in the adult.” In refusing to commit to a particular form and by receding from the human form—the fittest in the process of natural selection as postulated by Darwin—to a more bestial form, shape-shifters like the creature in The Thing (1982) enact a reversal of the evolutionary process and evoke in us the fear of unbecoming. Hadi applies such biological transgression to the act of migratory portraiture. To realize fully the impact his aesthetic choice has on viewers, one might turn to the concept of natural atavism. If our desire to gaze at a certain landscape stems from a neural throwback to the first act of migration, then Hadi’s painting—in depicting, like shape-shifters, the reversal of the evolutionary process, a return to wilderness as it were—similarly fires an old neuron. It unnerves us just like the toy snake unnerves New Zealand’s pigeons: if they fear a form they’ve never seen, then we fear the changes of the evolutionary process even when we know its outcome. Hadi immerses us in the primal moment of abjection when we as an evolving race were between stages, even as he depicts migrants’ experience between the Before and the After, between one place and another, between one way of living and another. Contemporary cosmetic commercials have trained our brains to view “before” and “after” as a composite with a positive consequence, but by depicting a body in transition—safely exiled, but exiled all the same—Hadi causes a rupture in this composite, thus heightening the disorientation we experience on gazing at the painting where the before and the after are not sequential stages but rather coexist uneasily in the same temporal frame, the bed signifying comfort earned by the act of movement, the nonhuman legs signifying psychic sickness (the mind unable to forget the landscape one has been forced to abandon) and physical discomfort (of orienting one’s muscle memory to a new landscape), and the suitcase, under the bed but visible, signifying the act of movement that does not fully end even after the migrant arrives at his destination. In order to receive residence from a host country, asylum-seekers have to convince immigration officers that they are fleeing what in legal parlance is called a well-founded fear of persecution in their homelands. Today, European countries, overwhelmed by the biggest migration crisis of our century, have come up with a fleet of procedures to manage the situation, each EU member compiling, for example, a list of countries they consider “safe” and won’t accept asylum application from—France, for instance, will not give asylum to Indians, or Belgium to Albanians. As a result, some migrants from these “safe” countries try to get asylum by claiming that they are, say, Syrian. So to determine if asylum-seekers are telling the truth about their country of origin, immigration officers use an accent test that checks to see if the asylum-seeker sounds Syrian (or wherever they claim they’re from). The test operates under the assumption that everyone from a particular place sounds a certain way, thus binding speech to territory and deporting—incorrectly in several cases—those who don’t have the “right” accent. The act of talking thus becomes a testimony to one’s origins in the act of forensic speech analysis. In his painting Conflicted Phonemes (fig. 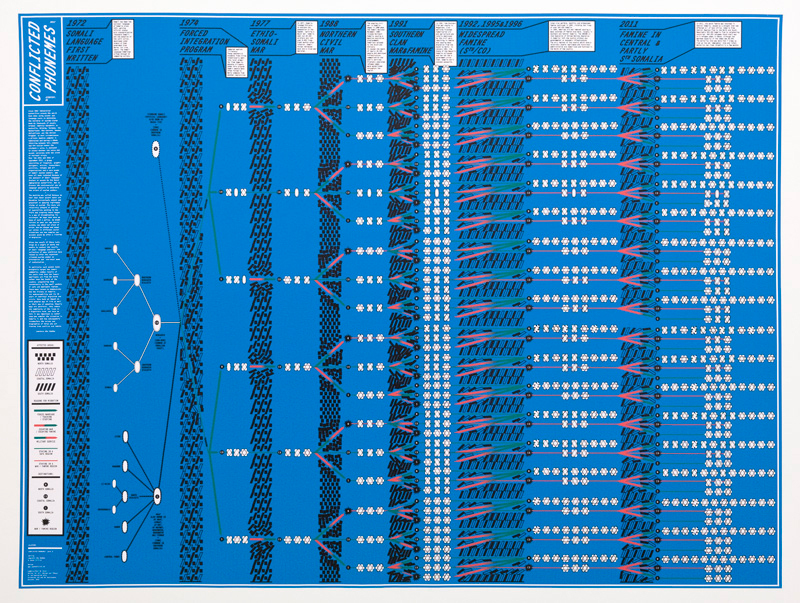 2), the Jordanian artist Lawrence Abu Hamdan turned these linguistic testimonies into a visual composition: first he mapped the voices of the asylum-seekers to sound-waves, then he turned these sound-waves to abstract patterns on a blue background. Hamdan holds the speech of the asylum-seekers at two degrees of removal, and in doing so, as an aural cartographer, he immerses his audience in the asylum-seekers’ experience of the accent test: the test, their first encounter with the host country, becomes our first encounter with them; further their voices, in not being heard, work like an invocation: rather than inviting us into the heart of individual stories, the painting asks us to critique the accent test that itself does not listen to the individual’s narrative but rather functions as a mediation between the human act of listening and the political act of border control. Hamdan also produced a thirty-minute audio documentary called The Freedom of Speech Itself (2013). Composed of statements from asylum seekers, immigration lawyers, and phonetic experts, among others, it was made available in The Showroom, a museum in London, and revealed to listeners the flaws in the accent test. When we enter a traditional museum space our first instinct is to look. Hamdan’s documentary, however, works predominantly with the aural. So when we encounter the novelty of his form in the space of a museum where we look out of habit, our aural senses, in the absence of visual cues, slowly start to perform the act of looking. Such a reorientation of senses is not an uncommon adaptation strategy. For instance, prisoners of Saydnaya, a Syrian torture prison, were held in complete darkness, and upon their release, based primarily on their “ear-witness testimony,” researchers reconstructed the prison’s architecture, sound thus employed to sculpt space. The cultural theorist Dominic Pettman, who researches the intersection between habit and technology, also notes that disembodied voices have the uncanny ability to animate, in our imagination, the body that’s absent. Hamdan’s Western audience has no visual reference to associate with the asylum-seekers whose story they listen to. Because they look for it as museum patrons, what they see is the body that the disembodied voices animate in their imagination: not a body with a specific face or physical traits but a body with a story that is specific and fleshed-out from multiple perspectives and has, as a result, the qualities of a mentally constructed visual. In giving asylum-seekers this body of specificity, and in doing so through an audio project, Hamdan equips his audience with the ability to listen to and empathize with their narrative of movement. In giving asylum-seekers this body of specificity, and in doing so through an audio project, Hamdan equips his audience with the ability to listen to and empathize with their narrative of movement. 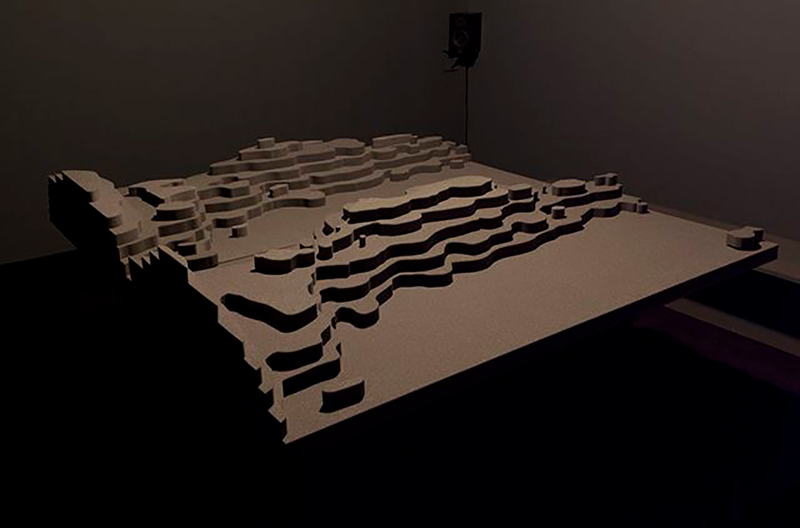 In one of its more recent iterations, The Freedom of Speech Itself was accompanied by sculptural forms called Voiceprints (2015) that use sound frequency and amplitude to give physical form to two different pronunciations of the word “you” (fig. 3). The sculptures materialize the ideology behind the accent test: the binding of territory to voice. Rather than act as visual counterpart, these sculptures, constructed from acoustically absorbent foam, extend and amplify, literally and figuratively, the listening experience that the documentary immerses its audience in. The disembodied voices that shape the sculptures—and by extension the contours of the physical space that the audience enters—may be likened to the ghostly presence that shapes the physical territory of haunted houses: doors shut in the absence of wind or human presence, the inanimate—furniture—becoming animate, a closet leading to an elaborate labyrinth, the house, once entered, feeling bigger than it does from the outside. While physically deviant features are what evoke the uncanny—ghostly architects contorting the house into impossible shapes—our experience of the haunted house trope has also trained us to associate geographies that behave in strange ways with a paranormal presence. Hamdan’s sculptures are, on one level, uncanny because they are shaped by a disembodied voice, but they also unnerve us because our minds are trained to associate strange spatial phenomenon with the spectral. Metaphor . . . [carries] a cargo of meaning across the oceans that divide us. Metaphor is how . . . one species attempts to comprehend others. With this gift, humans listen and speak more intensely and the meanings of all things . . . grow outwards. . . . Metaphor works with the legerdemain of the psyche, the lightest of touches to shift the mindscape, transforming one thing into another, leading to new ways of seeing. Metaphor follows Emily Dickinson’s injunction to “tell the truth but tell it slant.” Metaphor, says Townsley, changes the world by changing people’s perceptions of it. With metaphoric vision, empathy flows, knowing no borders. Migrant-artists aim to replace widely circulated misperceptions about migrants with narratives that depict migration as the nuanced and precarious experience that it is. It is the purpose of migratory art to generate moments of contact and, consequently, empathy; rather than merely pitying refugees or responding with guilt, whose forceful sensation in and of itself feels like some kind of absolution to the observer, this particular form of empathy aims to be an active response, one that evokes both emotion and a desire for action which leads to a fundamental change: at the very least, or as a beginning, an alteration in perception on what it means, really, to migrate. Julio Cortázar, Literature Class (2017). R. A. L. Cruz, Mutations and Metamorphoses: Body Horror Is Biological Horror (2012). Denis Dutton, The Art Instinct (2009). Alan Travis, Accents on Trial (2003). Dominic Pettman, Sonic Intimacy (2017). Alex Rotas, From “Asylum-Seeker” to “British Artist” (2011). 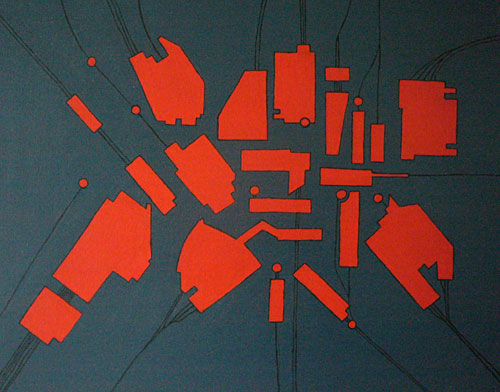 Nikos Papastergiadis, Spatial Aesthetics (2010). Mieke Bal, Migratory Aesthetics: Double Movement (2011). Jay Griffiths, Forests of the Mind (2012). 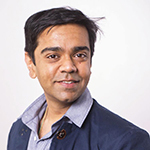 Shastri Akella is a PhD candidate at the University of Massachusetts (Amherst), where he earned an MFA in writing. His thesis examines the intersection between migration and monster studies. 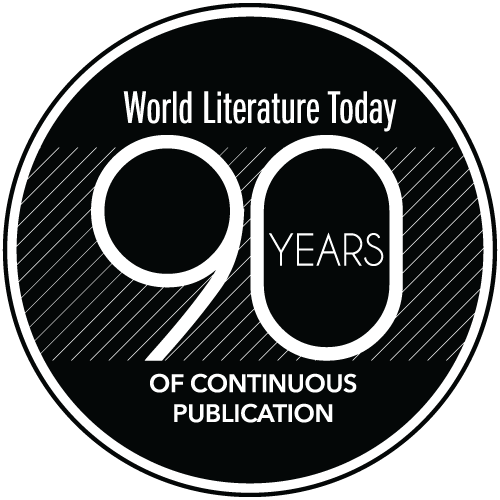 His writing has appeared in Guernica, Electric Literature, The Rumpus, and The Common, among other places. 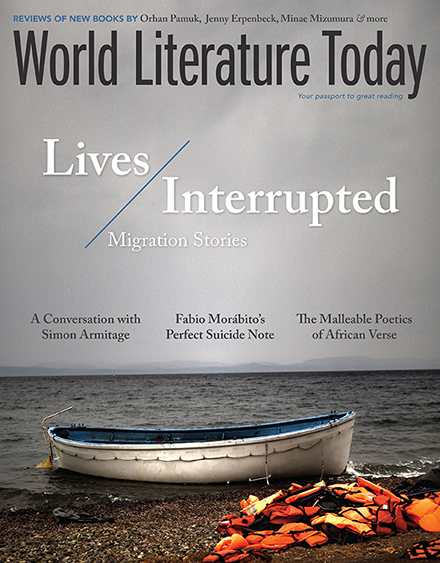 “Lives Interrpted” features eight writers’ refugee and migration stories.